The My Mentor and Me series, published in partnership with the Governor’s Prevention Partnership of Connecticut, provides a road map to the mentoring experience, with fresh and age-appropriate activities for each week the pair meets during the school year. A cost-effective and valuable resource for all mentors! Preparing My Mentor for Me answers the many questions that can, and frequently do, arise. Whether a first-timer or a seasoned veteran, you will find in these pages invaluable advice to help you unlock the door to positive communication with your mentee. Don't forget to check out our free publications as well. We can also design custom curriculum and other training materials to meet your program's needs. Get the latest program advice in our Tips from Dr. Mentor section. This guide is designed to help mentors and mentees at the elementary school level share in a mutually rewarding experience. It contains 36 fun and meaningful activities for every week that a mentor would meet with a youth during a full school year. The lessons extend far beyond the school walls. Consider using this handy guide as a way to thank the mentors in your program, to give to them at the end of their first training to become mentors, or to encourage prospective mentors to come aboard. Companies who have employees who mentor love to purchase and give these as a gift to their own mentors. This activities booklet, the third and final one released in the My Mentor & Me series, helps mentors and mentees share in their mutually rewarding mentoring experience. As with the booklets aimed at the elementary and high school years, this version contains week-by-week activities with lessons that impact far beyond the school year. It also features activities that address bullying behavior and ideas for preventing bullying among middle school-aged children. This version of the My Mentor and Me handbook features 36 weekly activities for mentors of high school youth to guide the relationship through the school year. Topics include goal setting, career planning, college preparation, and personal development. This guide is an excellent resource to help mentors build a strong relationship with their mentee and help guide young people from adolescence to adulthood. Mentor, mentee, and community... you can help them all by supporting this fashionable fundraiser! 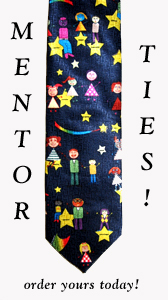 Proceeds from these ties go directly to the Norwalk Mentor Program in Dr. Mentor's home town of Norwalk, CT. Each all-silk tie features artwork designed by mentees in the program, depicting mentors, youth, parents, and dozens of stars with words that honor mentors, such as "friend," "leader," and "encourager." 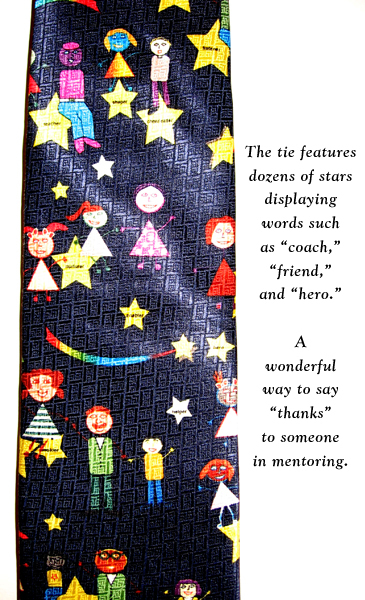 These colorful and unique ties are great for paying tribute to mentors, program staff, teachers, community leaders, and business associates. They are a thoughtful gesture any time you wish to share the magic of mentoring with someone in your life. Click here to see a close-up of some of the artwork on the tie. The cost is $25 per tie, which includes shipping. Click here for additional ordering information. MCG has produced many manuals and mentoring guides that will be useful for programs of all types. Descriptions, prices, and ordering information follow below. Be sure to also visit our free publications section for several downloadable resources that you can use to plan or improve your program. Dr. Susan Weinberger's personal account of her journey to promote and nurture the youth mentoring movement. An insightful look into how mentoring gained popularity as a key youth development strategy, punctuated by Susan's unique humor, passion, and personality. The cost is $20 per copy. Click here for additional ordering information. A 50-page guide which includes: tips for getting started, creating an advisory board, identifying resources, setting standards, establishing goals for the program, recruiting mentors, identifying youth, screening, parent permission, agenda for a training session, matching youth, family involvement, strategies for each mentoring session, tips for mentors, recognizing and retaining mentors, termination, fundraising and evaluating programs. This item is no longer in print and has been replaced with the brand new and more comprehensive Preparing My Mentor For Me (see above).